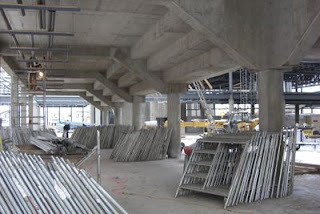 In my last post on the Multiplex I posted some pictures from inside of the construction site. Today I've got more images to share, this time though you'll be getting a look into the future of the project rather than at how it stands today. 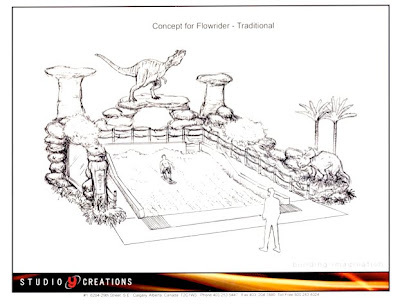 We approved going ahead with just under $900,000 worth of dinosaur related theming elements. 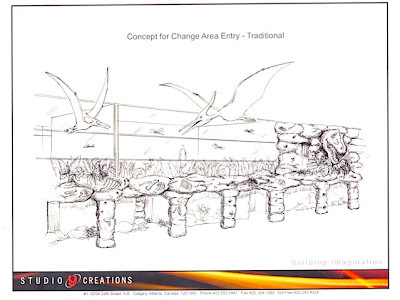 It's always been a part of the plan to include a theme in the aquatics centre (the $900,000 has been in the project budget since the beginning). I think this is important because it will set the stage for the multiplex, and the aquatics centre in particular, to become a "can't miss" attraction in the city. 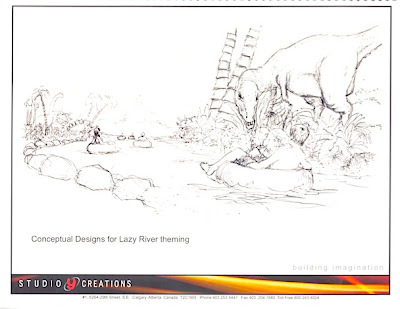 The reason it's dinos is to tie in to a local element - the Pipestone Creek dinosaur bone bed and the future River of Death & Discovery dinosaur museum. The vision, or my vision anyhow, is that when both facilities are up and running our area will have a highly marketable tourism attraction: "Go to the Museum and Don't Forget to Visit the Waterpark!" It might sound far-fetched today but with a little planning & coordination that might just be something that attracts people to the area and keeps them here a few days longer- all the while contributing to the local economy. As you come out of the change rooms you exit through rock walls over grown with vines and embedded with fossils. There are pterodactyls in the air overhead. Right in front of you is the children's pool and the spray deck. You can climb up in to the tree-top to be under the big dumping bucket with giant dragonflies around you. 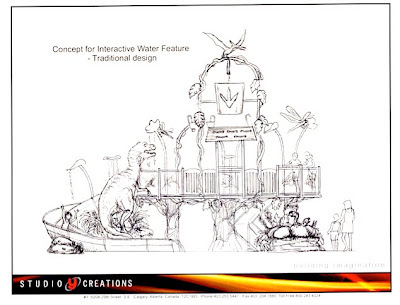 Around the back of the tree-top water feature are the stairs which go right through huge dino bones sticking out of the ground. 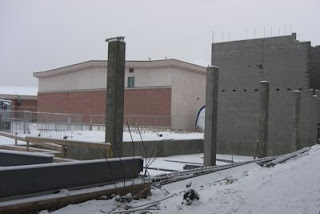 Way across to the north end of the building is the tower that leads up to the start of the waterslides. 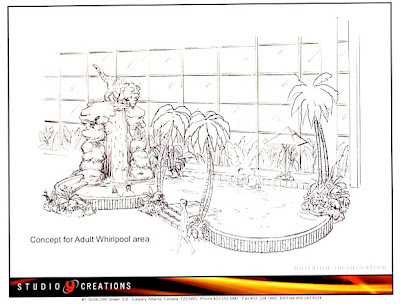 As you speed down the bodyslide you come splashing out of the mouth of a T-Rex. 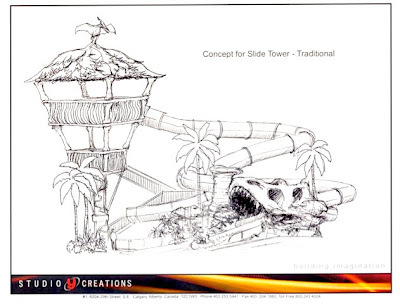 If you come down the tubeslide you end up in the adventure river where the current takes you through a mountain and around the river island. The view riding along the river is pretty exciting. 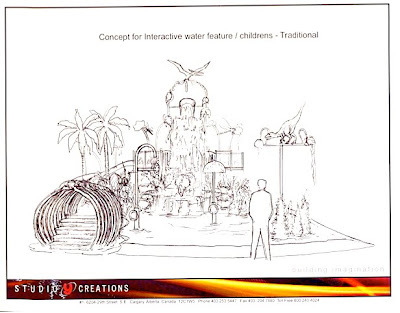 This final image is an example of the work from Studio Y Creations who will be doing the theming. 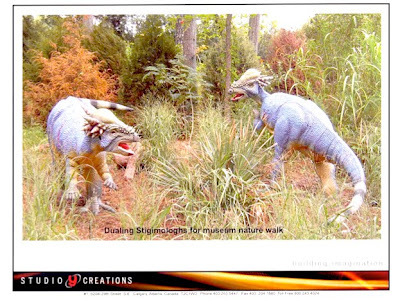 They have done work for the Tyrrell Museum and will have no problem making dinos that look realistic. I'm going to make sure that at least one of the beasts lumbering in the building is an authentic looking local. 2010 Budget Action - Who Voted for What? Last night at our regular council meeting we passed the budget for 2010 which was hashed out through our meeting on November 19th. (Full minutes here.) This budget was originally to have a 6.5% increase from the previous year but it now it's only a 2.8% increase. Below are all the motions that were made to sort out what council would, and wouldn't, fund for 2010. There were a lot of mixed voted as council members chose which items to support and which where lower on their personal priority lists. • MOVED by Alderman Given the Enforcement Services Administrative Support position be converted from casual to Permanent, with funding for benefits allocated within the existing department budget. • MOVED by Alderman Rice the Grande Prairie Regional Emergency Partnership Program Coordinator position be converted from temporary to Permanent, with funding for benefits allocated within the existing department budget. • MOVED by Alderman Given the Planning Assistant position be converted from temporary to Permanent, with funding for benefits allocated within the existing department budget. • MOVED by Alderman Rice the Committee refer the Legislative Services Public Relations account to General Government Services Committee. • MOVED by Alderman Wong the 2010 and 2011 Budgets be adjusted to add $40,000 per year and a total of up to $60,000 for “in-kind” support for the Wapiti Corridor Planning Group. • MOVED by Alderman Rice the 2010 Budget be adjusted to add $15,000 funding for the Bear Creek Pool Operations. • MOVED by Alderman Rice the 2010 Budget be adjusted to add $112,760 funding for the South Peace Historical Restoration Society – Anglican Church Restoration Project. 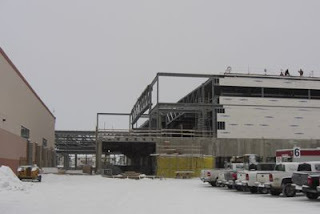 • MOVED by Alderman Radbourne the 2010 and 2011 Budgets be adjusted to add $60,000 funding in each year and a further commitment of $60,000 for the next three years for Grande Prairie Minor Baseball – construction of diamonds at Evergreen Park. • MOVED by Alderman Rice the 2010 Budget be adjusted to add $50,000 funding for the Centre 2000 Building Renovation Project. 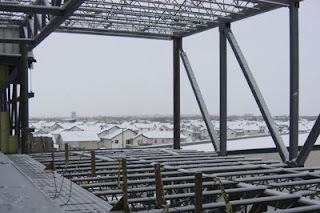 • MOVED by Alderman Given the 2010 Budget be adjusted to add $75,000 funding for the Grande Prairie Live Theatre Roof Replacement Project. • MOVED by Alderman Blackmore Committee refer to the Council Committee of the Whole 2011 Budget review the request for six additional RCMP members, in the amount of $712,000. • MOVED by Alderman Gustafson the 2010 Budget be adjusted to add $118,660 to fund one additional RCMP member. • MOVED by Alderman Wong the 2010 Budget be adjusted to add $104,500 to fund a Forensic Identification Assistant and a PROS Review Assistant civilian positions within the RCMP Detachment. • MOVED by Alderman Wong the 2010 Budget be adjusted to delete $400,000 for the RCMP Data Typing Pool program. • MOVED by Alderman Given the 2010 Budget be adjusted to add $50,000 to fund STARS. 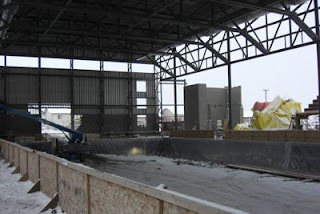 • MOVED by Alderman Rice the 2010 Budget be adjusted to add $112,666 to fund the SPCA Contract, subject to funding from the County of Grande Prairie. • MOVED by Alderman Rice the 2010 Budget be adjusted to add $5,000 funding for the City’s 100th Anniversary Project. • MOVED by Alderman Given the matter of identifying a capital project within the Muskoseepi Park Master Plan area as a potential 100th Anniversary Project be referred to General Government Services Committee. • MOVED by Alderman Blackmore the Committee refer to Administration the matter of initiation of the development of the South Montrose Site Green Area as per the Downtown Enhancement Plan, using in-house resources. •MOVED by Alderman Rice the 2010 Budget be adjusted to add $55,000 to fund the purchase of a Zimek Decontamination Machine. •MOVED by Alderman Blackmore the matter of purchasing a Zimek Decontamination Machine, for $55,000, be referred to Protective Services Committee. •MOVED by Alderman Rice the 2010 Budget be adjusted to add $50,000 to fund the purchase of a Reverse Osmosis System for the ice within Canada Games Arena. •MOVED by Alderman Given the matter of purchasing a Reverse Osmosis System for Canada Games Arena, for $50,000, be referred to Community Development Committee. • MOVED by Alderman Blackmore Committee refer to the Council Committee of the Whole 2011 Budget review the Dave Barr Arena Building Expansion Project, in the amount of $750,000. • MOVED by Alderman Deimert the 2010 Budget be adjusted to add $60,000 funding for the Affordable Housing Master Plan RFP. 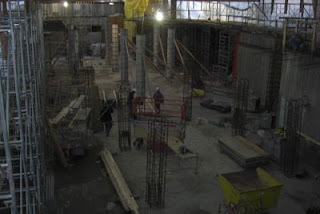 • MOVED by Alderman Wong the 2010 Budget be adjusted to redirect $1.5 Million of Alberta Municipal Infrastructure Program (AMIP) funding for the Downtown 101 Avenue Couplet Project to other previously approved infrastructure capital projects that are funded by taxes. • MOVED by Alderman Wong the 2010 Budget be adjusted to add $35,000 funding for the Wapiti Corridor Planning Group. •MOVED by Alderman Given the 2010 Budget be adjusted to reduce the Tax Revenue increase from $2.0 M to $1.5 M.
•MOVED by Alderman Given the Committee recommend Council approve the 2010 Operating and Capital Budgets as adjusted. 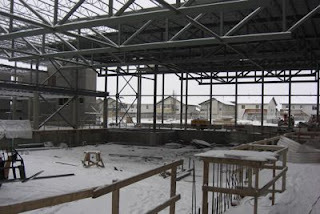 I had a chance to tour the construction site at the Multiplex this morning and I thought I'd share some pictures so everyone can have an inside look at what's coming for our community! Before I go any further - I have to say that I have the up most respect for all the trades and construction workers on site. It's supposed to get cold this weekend and although I hear they might close down if it's really cold - there were all there today working away and I was freezing after my 20 minute walk through! 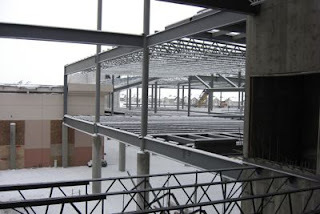 So, hats off to the Wright Construction team and everyone onsite, I appreciate the job your doing! This is heading north as you walk into what will be the south entrance of the building. The part with the yellow tarp is where the RCMP satellite office will be. Just coming in the south entrance, still looking north, you can see down the main hall. On the right is the fieldhouse and to the left will be the lease spaces. We turned right and walked into the fieldhouse. This is looking north towards the pool area. You can see the scaffold heading up to the two upper levels. Walking east through the field house you can see where the 4 squash courts will go, with St. Joe's high school in the background. That big hole is the 50m pool. This is looking North-East across the pool. This photo doesn't really give you a sense of just how big an area it is. 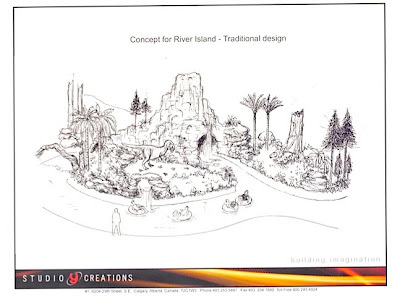 From just about the same spot as above but looking North-West this time, across what will be the adventure river, spray park - the two waterslides will be at the back. At the for North end of the building is the adult hot-tub. The low area that Felix is standing in started at my feet and goes all the way to the wheelbarrow behind. That gives you some idea of how big the tub will be! You should just about always be able to find a spot in there! 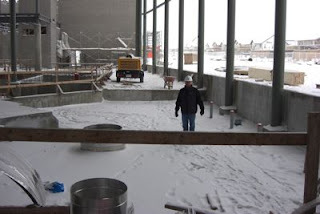 This is near the center of the building and is looking down into what will the be the shorter 25m program pool. All this will be under the pool when it is put in. On the second level, looking back South-West to the entrance we came through in the first photo. The Gymniks building is in the background. 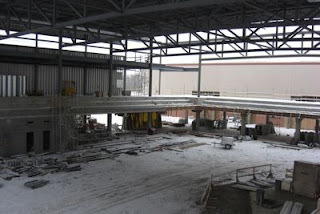 You can see how the concrete has been formed to provide seating on the second level looking into the fieldhouse. 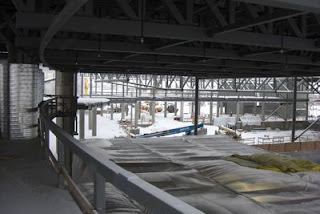 On the second level councourse, looking North-West, across the 50m pool in to the adventure river / spray deck area. For a sense of how big the space really is check out the lower right of the picture - see that tiny worker!? He's loading something on to the boom of the man-lift. From the same spot as above but looking more directly West. The slightly curved steel railing running from the bottom centre will be where a glass wall provides a view into the pool area. 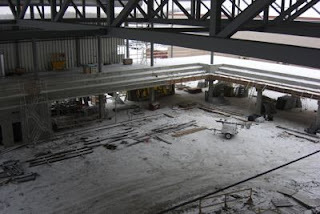 Further along the second level concourse, looking West again. The floor here isn't finished but you can see the elevator shaft on the right. Walking along here will lead you into the 16,000 sf fitness area. 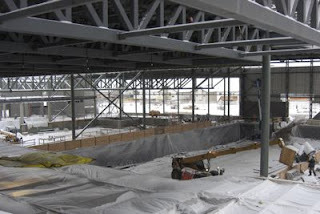 Third level, in what will be a mechanical room. 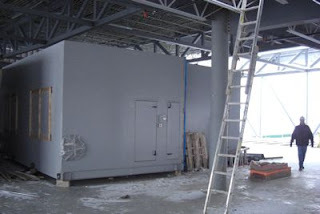 I had to take the photo to show how massive the mechanical system will be - those giant grey boxes with the small doors are actually part of the air handling system and there were at least the of them up there! On the third level running track looking back across the fieldhouse to the South-West entrance again. Finally a parting shot from the third floor mechanical room area. Looking North across the houses in Mission ... 214 Place is a tiny square in the center-left of the picture. Now that we've got a reasonable amount of snow on the ground it's pretty timely that the city is passing on information about our snow removal program. It's big job cleaning city streets; the roads classified at the Priority 1 & 2 levels (check the map below) equal about 133KM of work. Keeping in mind that over much of that distance crews have to work around curbs, traffic, homes and parked cars it's no wonder it's time consuming job. The information below will be circulated as a flyer to every household in GP through Canada Post. The goal of passing on the info to help the public understand how the city prioritizes which streets get cleaned first and how the public can help make the operation more effective by complying with some of the bylaws in place. This flyer is intended to provide City residents information regarding snow removal for the 2009/2010 season and answers some commonly asked questions regarding Snow Removal and Ice Control. • What Are the Priorities for Snow Plowing on City streets? Priority 1 - Major Arterials; 100 St, 84 Ave, 68 Ave, Resources Rd, Hwy 40 - Wapiti Road, etc. Priority 2 - Transit Bus Routes and Major Collector Roadways; Crystal Lake Drive, Mission Heights Drive, Poplar Drive, Royal Oaks Drive, etc. Check the Residential Snow and Ice Control webpage at www.cityofgp.com/citygov/dept/trans/worknotices/ for more information on the program. • Where Does the Snow Go? Priority 1 and 2 routes - Snow will normally be plowed to the middle of the road and hauled to the City Snow Dump or will be pushed over the curb and onto the City-owned boulevards. Sidewalks on Both Sides - Snow will either be plowed to the middle and removed or plowed and stockpiled to the sidewalk on the even numbered side of the road on even years or the odd numbered side of the road on odd years. Sidewalk on One Side only - Snow will generally be plowed to the side without a sidewalk. Snow will be pushed over the curb and onto the City-owned boulevards. No Sidewalk - The snow will be plowed to both sides. 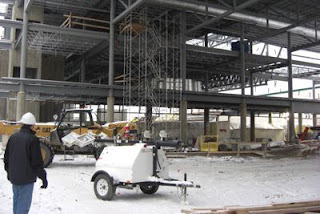 • What is my responsibility for Snow Removal and Ice Control on the sidewalk along my property? Bylaw #C-1166: Every Occupant, or owner, of property adjacent to a sidewalk, shall remove, or caused to be removed, and cleared away, any snow or ice from the adjacent sidewalk and the removal shall be completed within 24 hours following the most recent deposit of snow or ice. Do not dispose snow on City Property. Snow removed from sidewalks and private lanes shall not be placed within the City’s roadways. • Can I park my vehicle on a Permanent Snow Route? Bylaw #C-1166, and Snow Removal and Ice Control Policy 606; the Roads indentified as Priority I and Priority II for Snow Removal and Ice Control and will be declared Permanent Snow Routes from Nov 15, 2009 until April 15, 2010. A person shall not park a vehicle or permit a vehicle to remain parked on a roadway marked as a Permanent Snow Route. All vehicles parked on marked Permanent Snow Routes following the declaration are subject to a fine and/or immediate removal and impound at the expense of the registered owner of the vehicle. A map of the Permanent Snow Routes (1.8MB PDF Map HERE) available for view by clicking the “Maps” link on the City website at www.cityofgp.com . We thank all residents of the City of Grande Prairie for their co-operation and if you need to reach us to report hazardous road conditions, have questions about our Snow and Ice Control Program or on any transportation related issue, please call 780 538-0354 or email us at Transport_contact@cityofgp.com .